Today is the start of another Camp NaNoWriMo (www.campnanowrimo.org), and once again I’m throwing my hat into the ring. The “official” National Novel Writing Month in November (www.nanowrimo.org) is aimed at writing 50,000 words of the first draft of a novel in thirty days. Camp NaNoWriMo in April and July is a lot more laid back. You can choose your word count goal and project type including revision, screenwriting, and pretty much anything you’d like to do. The main goal is to get writing and keep writing. With the NaNo website, forums, and cabins, you have a built-in cheering section and support system. This time, I’m planning to work on something different than the usual. Since I’ve reopened the blog, I need to create content if I’m going to stick to a weekly post schedule, so I intend to use the month of July to create a backlog of blog posts. I already have a bunch of half-written posts that need finishing, and I have many more ideas of things to write about. At least, that was the initial plan. A few days ago I came up with an idea for more novellas set in my science fiction universe that will explore the concept of first contact between humanity and alien races. I’m a firm believer in “if the muse shouts, listen.” The ideas are flowing, therefore I also intend to use July to work on fleshing out these stories. So I’m looking forward to July with both a sense of anticipation and trepidation. Time to go into finishing mode on those blog posts and make them ready for general consumption. Time to leap into the unknown on my story and find out what happens. 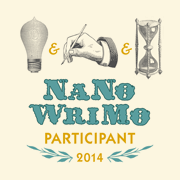 It’s not too late to sign up for Camp NaNoWriMo. If you’re interested in trying your hand at writing, now’s a good time to get started. Check out the website and see if NaNo is for you. Yes, I’m addicted to notebooks, and I’m not afraid to admit it. I love the potential inherent in a new notebook – all those blank pages, just waiting to be filled. I prefer composing with pen and paper. Something about watching the lines leave the tip of the pen almost becomes a meditation fueling my creativity. And yes, I have many more notebooks than I need right now … and no, that’s not stopping me from picking up new ones as the fancy strikes me. I’ve been wrestling with two issues with regard to notebooks. One is compartmentalization. I’ve designated certain styles of notebooks for certain types of writing. For example, all my fantasy universe notes are in one style of notebook while my science fiction universe notes are in another style. This works well to keep like with like, but I run into difficulties when I’m working on one task but come up with an idea for another and don’t have the right notebook with me. And what should I use if I want to work on something entirely different? Writing ideas in the wrong dedicated notebook inhibits me, and that’s a problem. The right tool for the right job and all that (or is it the write tool for the write job? ), but the tools should not get in the way of the work. My current solution is to declare a section at the end of each notebook as “Miscellaneous” to capture any stray ideas before they escape, then transfer the writing to the correct notebook later. I’ve also designated a couple of “anything goes” notebooks to be used for any type of writing. We’ll see how well that works. And speaking of inhibitions, the second notebook issue is in regard to fancy notebooks. Modern notebooks have come a long way from the simple spiral-bound days. Walk through any store selling office supplies and you’ll see gorgeous notebooks, but fancy notebooks are their own special trap. A fancy notebook should be filled with fancy ideas and fancy writing, shouldn’t it? Yet the process of writing yields lots of writing which can be downright ugly, especially in the early stages. So is it wrong to sully the pages of a fancy notebook with infant ideas that might make a mess of all those pristine pages? After long deliberation, I’ve decided that the answer to the question, at least for me, has to be no, it’s not wrong. I’ve heard the recommendation to use ugly notebooks as a way to lower the pressure of expectations on oneself, and to some extent, I agree. An ugly notebook can contain anything, so it’s easier to just “let ‘er rip” and experiment. Yet if I deliberately choose to use ugly tools, something within me begins to ask why I’m not worthy of using pretty tools instead. When I’m in the zone of creativity and the ideas are flowing, my tools don’t matter; I could use crayon on newsprint and be happy. But if I’m struggling with the writing, then the tools gain importance. Success in any creative endeavor requires the confidence to allow oneself to make mistakes. Choosing to use a fancy notebook boosts my confidence. I choose to surround myself with beauty while I attempt to create beauty. When I sit down to write, I never know what’s going to come out of the pen. The initial writing might not be pretty, but it might lead to something beautiful later. Shouldn’t an idea be allowed someplace safe and pretty to incubate? So I’ve been allowing myself to crack open the fancy notebooks and use them. I refuse to be intimidated by my tools. Time will tell whether this course is correct. In the meantime, I will enjoy the serenity of beauty every time I open my fancy notebook to a new blank page. Flames roared down the tunnel. Screams, then silence. I’ve been considering the nature of blog posts, or perhaps any sort of writing intended for an unknown audience. One of the techniques I’ve always relied on when writing is to know my intended audience. By understanding who will read a particular piece of writing, I can make informed decisions about choice of language, level of detail, where to start and end, and so on. Confusing the reader (or boring the reader) is a sin. Yet when I post something here on my blog, it’s open for anyone to read. That’s rather daunting. Who’s on the other side of the screen? Someone I’d like? Someone I’d despise if I met them in person? In the end, does it really matter? I think the type of reader I’m hoping for is someone who will read my words and think about whatever message is buried within them before drawing their own conclusion. Do I expect every reader to agree with or like what I write? No, of course not. What I expect is due consideration. I cannot choose my audience. All I can do is write as true to myself as I can. The act of writing is an act of discovery for both writer and reader, and sometimes it amazes me what treasures I can discover with just a little research. For years, I’ve used the phrase “I shot an arrow into the air,” but I never looked up the source material until now while working on this post. Longfellow’s poem “The Arrow and the Song” describes this very topic. In the first stanza, the narrator shoots an arrow into the air but cannot follow its flight. In the second stanza, the narrator sings a song but cannot tell where it lands. In the last stanza, the narrator long afterward finds the unbroken arrow in an oak tree, and finds the song in the heart of a friend. So this is me reopening the blog (again). With every post, I’ll shoot another arrow, and perhaps you, my reader, will discover another song. I threw out some old pens today. It was sad, but also satisfying. There’s a difference between throwing out an old dried-up pen that won’t write because of disuse and throwing out a pen that’s empty because all the ink has been used. Empty pens are marks of achievement. 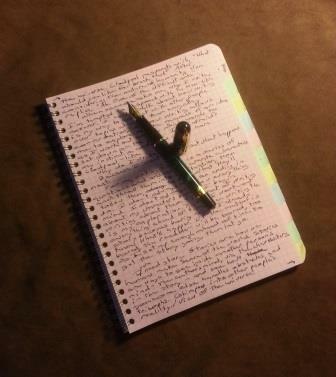 An empty pen means words written down. And I wonder what the discarded pen has assisted in creating. Profound words, like prose for my novels? Helpful words, like critique for my friends’ work? Or mundane words, like to-do and grocery lists? Whatever the words, the emptiness is achieved potential. I tend to be finicky about my tools. The right pen and the right paper can do wonders to enhance my creativity, while the wrong ones can stifle the flow. At the very least, the tools of creation should become invisible while being used. Extensions of hand and mind. The conduit of words, images, shapes. Fighting with a pen that skips or is not comfortable in the hand impedes progress. What’s right and wrong depends on the project. 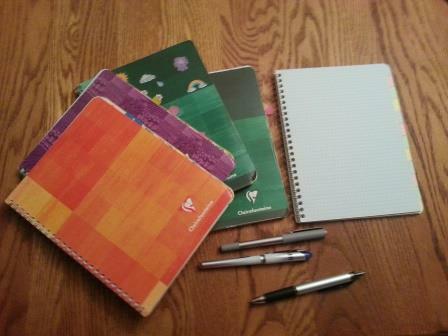 When I first began writing fiction, I discovered a particular brand of notebook that I liked and have used ever since. It has tabbed sections, colored paper, and fits in my purse. Actually, I select purses based on whether my notebook will fit. I have a small stash of notebooks hidden away in case my local stores stop carrying them. Again. Old notebooks do not get thrown away. They get saved and savored. My fiction notebooks contain prose for novels in various stages of completion, world building, questions and answers, story ideas, and random thoughts. Over the years, I’ve filled up about thirty notebooks. They’re old friends. Some took months to years to fill, others a matter of weeks. I still mourn the loss of the notebook that got stolen, and the one the cat annointed. The pages of my notebooks trace the history of my fictional universe from its inception so many years ago. It’s changed dramatically as I come up with new ideas and discard old ones. Periodically, I flip through my notebooks and transcribe notes in the computer, or flag ideas I’ve forgotten. Feels like an archaeological dig with treasures long buried awaiting rediscovery. I figure anything I’ve written down more than once must have something going for it. I’m about to start a new notebook. Fresh pages waiting to be filled. Sometimes a blank page can be intimidating, but I’ve learned not to be intimidated by these notebooks. This new one is next in a series, that’s all. It’s a place to record my current thoughts. To test out prose. To work out ideas. I write down questions and whatever answers that come to me, then write down the questions sparked by those answers, and so on. No pressure. I give myself permission to use my notebooks as a safe place to experiment. If an idea blows up, so what? I have more notebooks to fill. New notebook. Old pen. Let’s see what wonders I can write. Recently, someone asked me, “Why do you write?” I was dismayed when I could not come up with a straightforward answer, so I decided to write about it. When someone asks me why I write, I’m tempted to respond with a Wen-like answer. I could talk about how writing is my way to connect with other people over topics more complex than everyday conversation, or how writing allows me to explore all the nuances of an idea while I work out which words to set down on the page. I could even talk about my long-term plans to get my novels published and expand the boundaries of my story universes. But my instinctive response is much more Clodpool-like in nature. Because I want to find out what happens next. All my life, I’ve read other people’s stories. It’s my turn now. I want to give back the same type of enjoyment I’ve always received through reading. To share my perspective. To teach. Sometimes, simply to point out “Hey, isn’t this concept wonderful?” and watch someone smile. While you consider, I’m going to decide what I’d like for breakfast. I’ve just been ambushed by another idea. Not the first time, and not (I hope) the last. Ideas are tricky that way. You can be busy working out the nuances of one idea, when bam! A second idea shoulders its way to the front of the line. Great, right? Surely two ideas are better than one. And maybe if you put the two ideas together, they can form a third, and a fourth, and … eventually a muddled headache if they can’t be corralled. It’s a matter of resources. Limited amount of time and enthusiasm. Other priorities intervene, like all those pesky necessities of life such as eating and sleeping. Other creative tasks clamber for attention, too. I write novels and the occasional short story, and I also sculpt polymer clay and make beaded jewelry. And draw. And make gemstone trees. And paint figurines. And… you get the picture. So now I’ve come up with an idea for a webcomic. It’s an idea I’ve had before that I never fully developed, and now it’s resurfaced with lots more detail and quite possibly a viable way forward. I think I can make it work, with a lot of time and effort. And that’s the problem with an idea ambush. When a new idea strikes and screams for your attention, how do you decide what to work on? Put the work for the old idea on hold and play with the shiny new idea, or make the new idea wait until all the tasks for the old idea are complete? If I put the old idea on hold, I lose momentum toward finishing a project. Finishing is important. I’m sure I’m not the only one who has tons of unfinished stuff sitting about waiting for attention – unfinished stories to revise, unfinished craft projects that just need a few final touches. Sometimes I go into finishing mode and not start something new until I’ve cleared out some of the old. If I make the new idea wait, I run the risk of losing enthusiasm. When I finally get around to playing with the new idea, I might not be as interested in it anymore. I’ve had that happen, too, and the idea is lost, or never is developed as well as it could be. So how do I decide what to work on? I’ve never found a clearcut answer. Sometimes the new idea is just a distraction when what I need to do is plow forward and finish what I’m working on. Sometimes I need a break from the old, so the new idea acts as a palate cleanser. By working on something else for a while, I return to the old idea with fresh perspective. My general guideline is this: If the muse is shouting, listen. At the very least, I capture notes about whatever is currently firing my enthusiasm before that enthusiasm fades. Sometimes the new idea needs time to percolate before it can be fully developed, in which case I go back to the old and continue. Sometimes the new idea is fully formed, so I capture it before it can escape. And sometimes I do a little of everything. In general, I like to focus on one project at a time, but sometimes I also like to work on projects in parallel. I can only devote so much attention to any given project in a single day, so having more than one project to work on helps. As today’s enthusiasm fades on one project, I can switch to another and still keep going. The webcomic is going to take a lot of time and effort, therefore it’s going to be a long-term backup project while I finish my other works in progress. I need to hone my drawing skills, figure out how comics are put together, explore the new universe and characters, and oh yes, come up with a story. Lots of work, but it’s exciting. Next month is National Novel Writing Month (NaNoWriMo), so I’m planning to use the time to write out the history of this new universe and figure out some stories to tell. I intend to use the thirty days and 50,000 words to decide whether this is going to be a viable idea to explore. Wish me luck, and I wish you luck on whatever ideas ambush you!